From what I understand the JIB Awards are done. I haven't kept close track of the voting and I can assume safely I'm not a finalist. I didn't expect it to be otherwise. 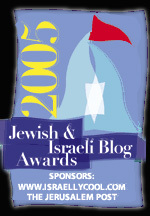 Awards tend to favor top ranked blogs or bloggers who very aggressively campaign for themselves. Social networking has never been my specialty and it's just not what I do. Much more than by my nomination though, I was heartened by the bloggers who independently mentioned my blog in the context of the awards and asked people to vote for me. Lemon Lime Moon, Something and Half of Something, the Keliata blog, Bamapachyderm and Me Ander. 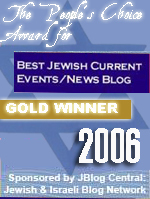 Meanwhile IsraPundit blogs that Moveon.org is unsurprisingly supporting the Palestinian terrorists over Israel. RightTruth reports that the beheadings are moving from Iraq and closer to home. The 'Loser' Award is Courtesy of Lemon Lime Moon. Get your own Loser Award at Lemon Lime Moon. That's great a loser award. What a great sense of humor. We can't take ourselves too seriously and if we have to bribe people to vote, what's the point? I'm fed up with 'ranking', such as TTLB, which went into the crapper about 6 months ago, has been in wild flux over the past two weeks. But it's being advertised as 'new and improved' when in reality it isn't worth anything. Site meters don't accurately reflect how many readers you have, most folks use RSS readers these days. Do we really blog for awards, ranking among other blogs, or just to vent our own feelings and chat with friends and foes? I don't worry about it any more. I post what I want, if folks like it (or not) they can comment, send a link, whatever. Life's too short and I want to enjoy it. I have a messiah complex.